the velvet bird: Let's hang out! My husband's band is going on tour again. Up until last year he has spent anywhere from 6 - 10 months out of the year touring, but last year was an odd one and ended up turning into a whole year at home. I got spoiled by this! So this time around when the time to start planning for tour came, I feel like I should be completely honest and say that I was a little bummed out by this idea. 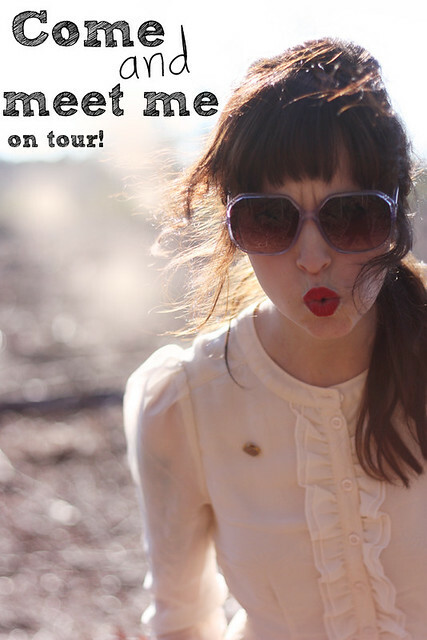 Touring kind of puts a damper on all of my grand plans for this little blog and for Etsy. I know quite a number of girls have written about this topic lately, but sometimes in the blogging world/community its hard not to feel slightly envious or competitive. Which feels so silly to be writing right now, because I am not that way at ALL in my 'real' life. So the idea of putting down some of the things I've been working on makes me feel kind of anxious and nervous. Sometimes in my crazy brain I get the feeling of 'I better get this grand idea in production for Etsy because if I don't someone else will and it will be too late and I'll never be able to do (insert project/idea here).' Isn't that stupid? So instead of letting myself get down about touring this time around and letting the crazy 'girl' part of my brain take over, I've decided to make the best out of it! I have been planning more portable projects to work on and will be hunting down thrift stores on the road whenever possible. And to remind myself how many people get to just travel around the practically everywhere in the country (multiple times). I have decided you guys are all so nice and so much fun, why waste a chance to be friends in real life?? Oh my! I wish! I was going to be in America this year too, but put it off until next year! I love Showbread!!! (my friends adore them too) So it would have been a win win. All those thrift stores are going to be amazing and I love that you are making such a positive out of all this! I'd love to hang out, but you aren't going to be in my area at all, it seems. Keep updating us with your whereabouts! oh me, i am afraid you're not to be anywhere near me. :/ but have fun on your tour! it's a grand idea. Fantastic idea!! When life throws you lemons...blah blah blah..! Vanessa is awesome and you should all want to hang with her cute self and not be nervous about it! I did it last year and can CONFIRM AWESOMENESS. that's me! or more like, i live here! i'd love to hang. love your blog. dig your style. let's be hommies! ahh..man your not coming to WV..haha..i totally understand..it's kindof boring here!! but the hubs is from Columbus..so i mights have to do a roadtrip!! I live in a completely different country, so too bad for me...but as to keeping your good ideas safe - try not to feel funny about it. Apparently telling people about a great original idea that you intend to put into action...IS not a good thing to do. I can't remember where I heard it, but it does pay to remember for every sweet person in the world that wants you to do well, there is an opposing not so sweet person who would rather do well themselves. Dude! Lets get together in Seattle! what an amazingly generous thing to do, seriously a great idea! you'll have to keep us posted as to how everything goes...very exciting! My girl brain makes me so mad sometimes!!! I'll plan on seeing you March first in Conway. I will try really hard to not have a migraine like the last time you were in Arkansas! Do you and those smelly boys need a place to stay? And if you think you could somehow be in Russellville earlier in the day, let me know soon and I will try to get the day off of work to take you to our very best thrift stores and flea markets! You've got a date in Tallahassee. We've got quite a few vintage shops around here. Ahh, I know exactly what you mean with the competitive part of blogging, but please remember: you're one of the most inspiring and cool bloggers around! Most of us never come around to setting up an amazing Etsy shop or make all of these incredible pictures, (oh, and having an awesome boyfriend who makes music for a living-though I can believe it's tough when he's on tour all the time-) like you do :) I hope you'll have lots and lots of fun! I've been a fan of Showbread since 2004, and I'm definitely going to be at the March 23rd show. I totally get what you're talking about with the competitive side of blogging. I honestly thought I was the only girl who felt like that. For a year, my husband was out of a job (he has one now), and I have been out of cosmetology school looking for a job at a salon. But it's frustrating to see all these girls doing what they love, and they seem so happy. But I really feel like God is doing something even though it seems like no doors have opened up. Hope to meet you soon, God bless. I'll be there in Seattle! You are coming very near my area! I live in Bloomington, IN! If you want to get together, hit me up girl! The blog world is a weird and wonderful place. I know just how you feel about feeling slightly envious about others doing what you want/wish to do. But remember most people are feeling this way (or at least this is what I have found). I love that you are letting the crazy 'girl' part of your brain take over and go on tour. You only live once right? Enjoy every moment of it! I wish I lived near one of the tour dates and we could go thrifting together. I love your blog! Whenever you are in Greenville, SC...you should definitely check out O-Cha Tea Bar. Thier bubble teas are amazing! On an unrelated note, the captcah that I have to enter in order to post says "catslutz". In the words of Charlie Sheen, "WINNING". Hope to touch base, soon!